Cheddar cheese was originally produced in the region called West Country which includes the shires Devon, Somerset and Dorset. These lush pastures have been lovingly tended by generations of families who started farming the land some 450 years ago. The West Country cheese makers was formed by a group of twelve relatively small cheese makers, who together spread across Devon, Somerset and Dorset working together sharing information on cheese making thus providing a quality hand-made cheese on the farm. 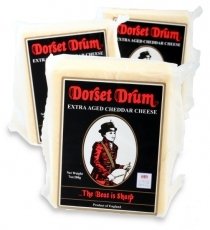 Dorset Drum is presented in a 2 kg round, coated in black wax to protect the cheese. Inside the paste is a pale yellow colour and is perfectly sized to portion for cheese plates and retail sales. Dorset Drum is hand-made English Cheddar using milk sourced exclusively from farms in the Dorset district. This cheddar has a soft creamy texture, a long sweet flavour and just the right amount of bite. Serve at room temperature with Oat Cakes, Baguette and Butter, quince paste or a great match with our Mostarda di Milano from Italy. Good Wine pairings can be made with full bodied dry white wines such as aged Chardonnay, Hunter Valley Semillion, or full bodied reds, desert wines and fortified wines.